Tour de Fleece seemed to have gone by in a flash. It's over now, and I didn't finish everything I wanted to, but I did finish quite a lot and started on other things too. One of my projects for the tour was this braid of Angora/Merino blend, which I dyed myself. I plan to knit this gradient yarn into a shawl. The spinning isn't going quite as smoothly as I'd hoped, however. First, this top is quite a difficult spin. The fiber got compacted during dyeing, and the angora is very slippery, so even after fluffing it up it's tricky to draft. I pull at it and before I know it the fiber has slipped away and my spindle is on the floor. Ack. My dye job wasn't super-even, either - it's blotchy, resulting in areas of super-saturation next to long lengths of pale pink. This yarn won't line up as evenly as the gradient I spun before, I can tell. It's going to be a little wilder, a little more rustic, a little more "conspicuously handspun". But I'm making peace with that fact. It's not perfect, but I do like the yarn I'm making. And it's so, so soft. I'm spinning it with a woollen-ish draw, and a tight twist - I did several samples and that's the combination I liked best. The yarn doesn't have much of the characteristic angora halo, yet, but that will develop with time. Hopefully the tight twist will reduce the risk of major shedding. The shawl I'm planning to knit is a pretty simple half-circle shawl, mainly stockinette, which will allow the yarn to take center stage - it's going to be the star, without anything complex trying to compete with it. 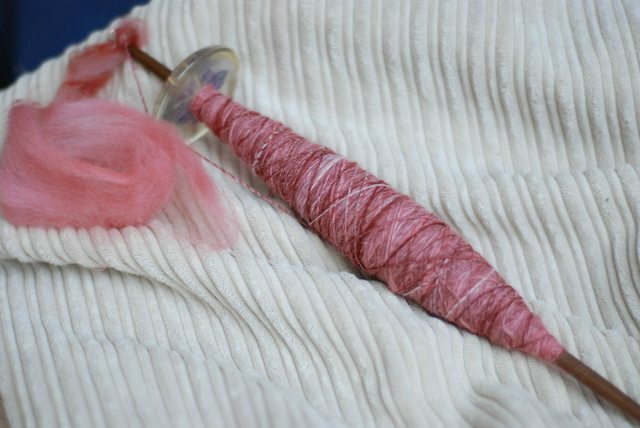 But before I think about that too much, I need to focus on getting the spinning done!